faceless book: The world's number one cycling city... or simply the world's number one city? The world's number one cycling city... or simply the world's number one city? 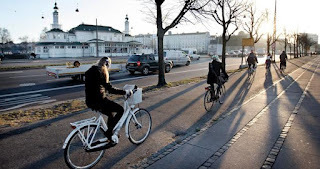 The photo above, associated with a recent BBC article called What Copenhagen can teach the world, certainly awakens some memory of my trip to Denmark last summer. My wife and I spent three days in Copenhagen, but our lodging for those three nights was not in the Danish capital city. We stayed on a farm in Dragør which was about 10 km away. On two of those days we rented bikes for the commute to Copenhagen and back. The weather was nowhere as good as the photo showed and there were no setting (or rising?) sun casting long shadows of bikers, but the scene was familiar. Looking back, I feel privileged to have had that experience. The only regret was that my wife, not an experienced biker herself, did not derive as much pleasure from the biking trips as I did. Work/life balance: Family is central to Danish life, and since there is little pressure to work overtime, the people have more time to spend with their families. Infrastructure: Sustainable architecture and sustainable infrastructure are central to city policy. The city is friendly to pedestrians and even friendlier to bikers. With about 40% of the residents commuting by bike every day, Copenhagen is arguably the world’s number one cycling city. Copenhagen is also trying to diversify its energy portfolio and strives to become carbon-neutral by 2025. Indulgence: Copenhageners know how to have a good time while taking care of the environment. Copenhagen consumes more organic food and is home to more breweries per capita than any other place in Europe. It also has more Michelin stars than any other Scandinavian city. It is therefore no wonder that Copenhagen frequently tops rankings of the world’s happiest, most liveable and best-designed cities. And that, along the fact that Danish people have a high degree of trust in their government, is the reason why even though Denmark has the highest income tax in the world, the people are willing to bear the cost. Let’s face it, the income tax range of Hong Kong is 0-15%, which is much lower than the 36.57-55.4% range of Denmark. But where would you rather be living?